This Easy Mistake Stitch scarf is made with Jade Sapphire’s gorgeous 12-ply Cashmere in color “Green Tea”. 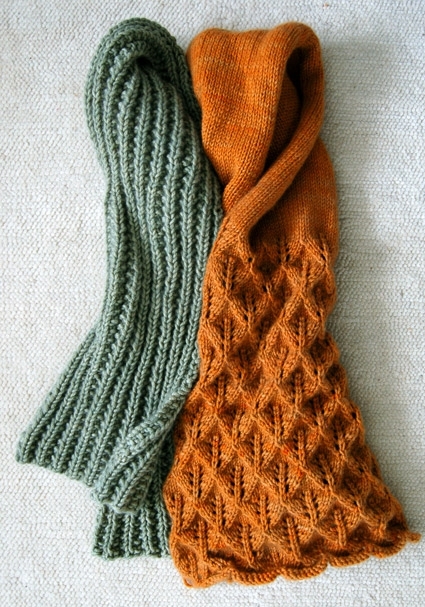 If you know how to knit and purl you can make this scarf! Mistake Stitch creates a deep and lofty rib that looks like so much more work than it actually is. If you’re interested in the Lovely Leaf Lace Scarf (the orange one on the right), you can find the full, free pattern right here! 5 skeins 12 ply cashmere. 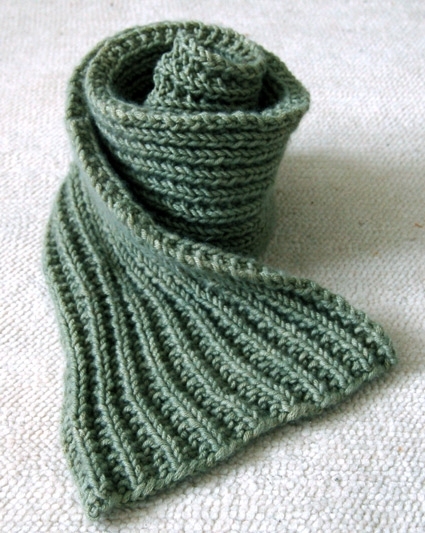 For this scarf I used Jade Sapphire’s amazing 12-ply Cashmere in color “Green Tea”. If you’d like to explore other yarns for this project, check out our collection of chunky yarns, you will need 300 yards total to complete the scarf. Bind off in stitch pattern. Sew in ends, wash gently by hand, block and let air dry. This is my third time doing this scarf in variegated yarn from RedHeart & I must say they have turned out beautiful. The first two were in black light & now am doing it in Icelandic. This is such an easy pattern to do on circular needles considering they are so much easier to use than straight needles. Keep up the good work love this pattern lots. For those interested in those yarns I got them at Walmart. Beginner knitter over here – I’ve completed 1 scarf before just using just the k-knot? Also did them on straight needles. I recently just bought circular ones so I was wondering how to transition. How long would this project take say I do 2 hours a day? Thanks for writing in! Although we used circular needles for this project, we knit this scarf flat, meaning back in forth in rows, turning the work at the end of each row. To use circular needles for knitting flat you simply finish a row, turn the work so the other side is facing you and put the needle that was in your right hand into your left hand and the needle that was in your left hand into your right hand, ready to go on the next row! Estimating how long it might take to knit this scarf is a bit challenging. Everyone knits at different rates. Your 2 hours of knitting and another knitter’s two hours of knitting could translate to a dramatically different amount of knitting. That said, this scarf goes quite quickly and most knitters can finish it in a few weeks. I appreciate the response! Excited to try the needles even though it seems more intimidating 😛 I’m excited to make this as a xmas gift so perhaps I’ll update here once I’m done how it came out! have given them all away. I searched & found out how to bind off in purl stitch it’s easy to do. So I started this on circular needles. I am a little confused. If you repeat the same thing each row isn’t each row different cause of the odd stitch? So in my second row I start with k2 p2 but that is going on top of p1 k2? Shouldn’t I be knitting into Knits and purling into purls? Thank you for writing in! I know the pattern can seem a bit confusing, but if you give it a try using any scrap yarn you have laying around you’ll see how it comes together! It’s because of the odd stitch that you will knit into your knits and purl into your purls. Here’s a quick break down of the pattern, just in case you might find that helpful. Row 1: K2, p2, repeat to last 3 stitches, k2, p1. Row 2: K2, p2, repeat to last 3 stitches, k2, p1. Row 3: K2, p2, repeat to last 3 stitches, k2, p1. Row 4: K2, p2, repeat to last 3 stitches, k2, p1. Just keep going like that! Please let us know if you have any further questions! Again, thank you for writing in! Thanks for this breakdown – I was confused about this also. We’re going to try it! Mathematically, this is still not making sense to me. That odd purl stitch at the end.. then I pick up and knit on top, makes sense, but I’m knitting 2… which means 1 on top of the purl and 1 on top of a knit… ? My brain wants to understand! I used the right size needles, but now, after about 6 or 7 rows, it is looking way way thicker than the picture.. I’m using a carisma yarn, like a medium thickness. Any advice? I think because I haven’t knitted in a few years I’m still getting my groove. I think I will take it out and do 23 stitches the way you suggested below.. and I’m going to keep trying this pattern even though to me it doesn’t make sense! Thanks for writing in! The math here and can be a bit challenging to wrap your brain around! I would say just trust the pattern over a small number of stitches and see how it comes out! The mistake rib is created by that slight mis-staking of knits and purls. It creates a lovely texture! They are right the scarf turns out beautiful. Just follow the instructions like they are written. The pattern is amazing. This is an easy scarf to work while you are in the car while someone is walking your dog at a park. Hi, I’ve just finished knitting this scarf and realized it seems too short at 48″. There’s not much you can do with a scarf that short in terms of how to wear it. It can’t be wrapped around the neck, but only can hang. I’m trying to get this out as a Christmas present and wonder if I need to get another skein… Is this length correct? Thanks for writing in! The intended finished length of this scarf is 48″. This is a shorter scarf that can be worn with one end down the front and one down the back. You can certainly get another skein to add length if you would like! The thing that I love about knitting is that you are the boss and can knit it as long as you want! I love this scarf pattern. I used Wool-Ease by Lion Brand -Fisherman, to knit a scarf for myself a couple years ago. I have worn the scarf ever since. It still looks gorgous and better than any scarf I have seen in the store to date. And even better I can wear it dressed down or dressed up. It is perfect. Hello! I was wondering what the best way to adjust this if I would like to make a thinner scarf? Thanks for writing in! The mistake rib is a multiple of 4+3 stitches. If you would like to make a thinner version you can cast on a smaller of number of stitches that matches this formula. For example, if you wanted a scarf that was about half as wide or 4 inches wide you would cast on 23 stitches (4 x 5 = 2 + 3 = 23). I hope everyone has a Merry Christmas & a Happy New Year. Hello I am looking to start knitting for the very first time. I like the look of this scarf, but want to make a thick luxurious hat. Is there a pattern for a mistake stitch hat with uses the Jade Cashmere 8 or 12 ply yarn? Thanks for writing in and welcome to the knitting world! We do not have a matching hat in mistake rib but you certainly can knit a hat to coordinate by using the same color. For the 8 ply cashmere, you can knit any of our worsted weight hats (https://www.purlsoho.com/create/category/knit-accessories/knit-accessories-type-hats+knit-accessories-yarn-weight-worstedaran/). For the 12 ply cashmere, you can knit our Super Soft Merino Hats for Everyone or the Cozy Ear Flap Hat. I am a new knitter. I started this scarf and ended the first row in the correct order of 2k1p. However on the next 4 rows, after I p2′ there are 4 stitches left a t the end, so I have been knitting 3 & ending with 1p. What am I doing wrong? Thanks for the question. Often, new knitters end up increasing or decreasing stitches, so I would recount your stitches and make sure you still have the amount you cast on with. If you do, then somewhere along the row you are not doing k2 p2 and are either adding or eliminating a knit or purl. Let me know if you have any other questions! I’m planning to do this scarf again in the Deborah Norville Everyday yarn I picked up on sale the day after Christmas it was 50% off at JoAnn’s. Want to make another mistake scarf using your super soft merino yarn. Is it best to use size 11 needles. I made this pattern a few years back with Noro variegated and used size 11. Please advise. I know I will need 3 skeins. Thanks for writing in! I would say that using size US 11 needles with the Super Soft Merino would be your best bet! As always, I would suggest doing a small gauge swatch to make sure that you like the fabric on US 11 needles. If it is too tight, you can go up a needle size and if it is too loose, you can go down a needle size! I am very New. Just started yesterday and now have 44 stitches. How do I get back to 39 stitches. What to do? Thanks for writing in! It seems like you may have increased by accident! In cases where this happens, I suggest ripping back until you get to a row that has the correct number of stitches and begin knitting from there. If you are not to far along, you may want to rip out and start over again. The best way to avoid this in the future is count your stitches every few rows to make sure that you are on track until you get in the swing of the pattern. Be assured that this happens to all of us from time to time and we all have to rip back! I am just learning to knit, so this pattern looks perfect. My daughter gave me some yarn to make her a scarf. (hmm)… Its not nearly as luscious as the yarn you feature, but I’ll get there! The yarn is “super bulky” 6, 106 yards/skein…I have 15 needles, and wonder if this will work. How many skeins do you think I’ll need to make it 70″ long?, and many stitches should I cast on? Thanks for your advice! Thanks for writing in! The beauty of this pattern is that it can be knit out of any size yarn with just a little bit of work! The mistake rib is worked over a multiple of 4 stitches plus 3 stitches. To make a scarf that is 8 inches wide as the one above, you will look at the gauge (stitches per inch) and multiply that by 8 inches. Make sure that the cast on number that you choose is as close to this number as possible while being a multiple of 4 + 3 stitches. For example, if you are getting 2.5 stitches per inch on the US 15 needles, 2.5 x 8 = 20 stitches. The closest stitch number to this that will work is 19 or 23 stitches. Estimating the number of skeins is a bit more challenging as your gauge has a lot to do with how much yarn is used. I would estimate 3 skeins but know that you may need more or less depending. I’ve inherited a box of beautiful hand dyed yarns that my mother was given years ago. She was to knit samples of the different yarns for the person who owned the sheep and dyed the yarn. I am not sure what I can knit with the yarn. The prettiest is a hand painted/dyed yarn but I only have 8 oz./280 yards (I think medium weight). The most I have of any color are 2 skeins of same weight. All patterns seem to use much more yarn. Any suggestions, I love this pattern and was hoping to make it with one of these gorgeous yarns. Thanks for writing in! How lovely! What a treasure that sounds like! Without knowing the gauge, I can only make some general recommendations. With the single color, you could make a hat. You will need to figure out that gauge in order to decide on a pattern that will work best with it. 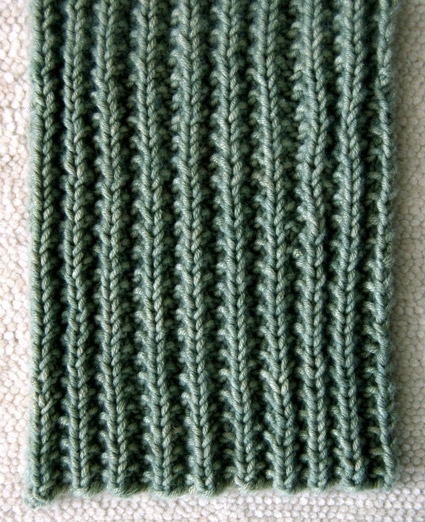 To do so, knit a gauge swatch with needles that you think would work well. If you like the fabric, measure the number of stitches per inch and then you will know roughly what type of pattern you could use! I think a scarf would be great using 2 or more colors. You could color block the scarf is colors that go well together and it would be lovely! You could also make a blanket out of a variety of colors. Our Super Easy Blankets are a great option as are the Bias Blankets. Thanks for the question. I suggest recounting your stitches and seeing if you’ve either lost or added a stitch by accident. If you are changing the pattern, remember that this stitch is knit over multiples of 4 + 3. Hope this helps! Hello! Can’t wait to get started in this. It will be my very first knitting project. My 6 year old son had already claimed it as his and has picked out the yarn. It is a worsted weight but seems on the lighter side: Neighborhood Fiber Co, Cobbelstone Worsted in Rock Creek Park. Tag says 4-5 sts/inch US 6-7. Do you have any suggestions? Thank you! How great to have your knitted item claimed because your son loves it! You can knit this scarf out of any gauge yarn with just a small adjustment. The stitch pattern is worked over a multiple of 4 + 3 stitches. So to get a scarf roughly 8 inches wide with the yarn that you are hoping to use, you will cast on either 35 or 43 stitches using the suggested needles! Has anyone used this to make a scarf for men? I have a dk Marriner marrino yarn. Would tht be ok? Sorry im new to knitting. Thanks for writing in! We have seen this scarf on men and women alike and it looks great on everybody! I think this pattern has definite masculine appeal. It is chunky and not your ordinary rib st. I think many of the people commenting forget it is called the “Mistake Stitch”. That’s what makes it unique. As a beginner you don’t have the problem of have K2P2 then P2K2 on the next row in your head yet. Just stitch it as the pattern says, and DO count stitches now and then so that you don’t have to FROG… That’s Rip-it rip-it. I am a complete beginner at knitting but love this scarf. Are there any tutorials you could advise that would give me an idea of where to even start with this?? I think this scarf is a great beginner project! Here are our Knit Stitch and Purl Stitch tutorials. Good luck with your project and let us know if you have any further questions! Hi! I’m a complete newbie in knitting, and I’m doing this pattern to my own scarf with normal needles, and I was wondering if I’m supposed to do k2, p2, k2, p2… for each row? Wouldn’t this make the columns that are present in the pattern not match? Wouldn’t doing every other row k2, p2… and every other row p2, k2… make the columns as they show up in the pictures? Sorry for having every sentence end with a question mark, I’m a bit lost. Thanks for writing in! As this pattern is a mistake rib, the k2, p2 stitch combination is set a bit off the create the stitch pattern. The columns will match up with a bit of texture between them. Additionally, the patterning does not pull in in the same way that a traditional rib does, causing the fabric to lay a bit flatter. Aside from the all-time favorite garter stitch, I am wild about the mistake stitch. For a recent project I used a variegated yarn in shades of purple and it turned out super. I am almost finished with tbis scarf. It is my first knitting creation ever! I love it. I am out of this world happy. But now I am at the time to bind off, and I am stuck. I have looked up how to bind off in the “east mistake stitch” and I can’t seem to find how to do it. 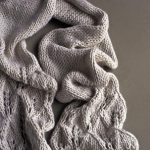 Can you provide me with a link to a tutorial or a break down of how I am supposed to bind off in this pattern? Thanks for writing in and congratulations on being so near to finishing your first project! We do not have a tutorial on how to bind this pattern off but I can help! When you are asked to bind off in pattern, you will work the pattern as you had on previous rows will binding off the stitches. Here the row that you work is: K2, p2, repeat to last 3 stitches, k2, p1. So to bind off, you will knit the first 2 stitches and then pass the first stitch over the second. This you will purl the next stitch and pass the first stitch on the right hand needle over the stitch that you just purled. You will then purl the next stitch and pass the first stitch on the right hand needle over the stitch that you just purled. You will then continue on in this fashion, knitting the next stitch and then passing over, knitting the next stitch and then passing over, purling the next stitch and passing over, etc. On the easy Mistake Stitch Scarf, I have a question. I see that you cast on 39 stitches. Then is every row K2, p2, repeat to last 3 stitches , k2, p1? Thanks for writing in! That is correct! The beauty of this pattern is how easy it is to achieve! You will repeat the same row for every row and the beautiful pattern is created. Hi, I’m following this pattern and mine is curling – what am I doing wrong ? I’m about 18 inches long now. Sorry to hear your scarf is giving you problems! I think the best thing to do is block the scarf by steaming it. I’m new to knitting and I don’t know what a multiple is or how it changes what I am doing. What is a multiple? I tried knitting the pattern following the K2 P2 until the last 3 stitches then doing K2 P1 and it didn’t look correct, it looked like a bunch of tangled yarn and I was wondering what I may have done wrong as well. Thanks for writing in! When we mention the multiple here, we are referring to the number of stitches should you want to make the pattern wider or narrower. So with a multiple of 4 + 3, you would multiply 4 x any number and then add 3 stitches to get a cast on number that will work here. For example, 4 x 5 = 20 + 3 = 23, the cast on would be 23. It does sound like you are working the pattern over the correct number of stitches. It should not look like a tangle of yarn. It is possible that you are knitting quite loosely and that this looseness is looking a little messier than you would like. I would suggest knitting at least 10 rows to get a sense of how the pattern looks. If it the fabric still seems too loose, you can try going down a needle size. Hi There! I’m a beginner and I love this scarf. I can knit and purl, but I’m not sure how to “bind off in stitch pattern”. I have only casted off from a knit stitch in the past. To bind off in the stitch pattern, you are going to follow the pattern that you were doing, you will bind off knitwise the first two stitches, then bring your yarn forward as if to purl, and bind off the next two stitches purlwise. You will keep doing this until you reach the end. I am just starting to knit and I have some skein of 6 ply lying around. I am planning to use wooden needles of size 9. I have tried to follow the pattern but I am getting clumps instead of the pattern. Could you tell me how many stitches I should cast? Thank you for reaching out! Mistake rib is a multiple of 4+3 for example: (4 x 9) + 3 = 39. I want to make this into a shawl using Sugarbush Motley yarn which is #3-light — 22 stitches = 4″ (10 cm) on 4.00 mm (US 5 – 7). I get a cast on of 111 stitches using a US 7. Am I correct? Thanks for writing in! I am happy to help! If you swatch in stitch pattern is yielding 22 stitches over 4 inches, the number of stitches per inch would be roughly 5.5. For an 8 inch wide scarf, 5.5 stitches per inch x 8 inches would be 44 stitches. The nearest number that would match a multiple of 4 + 3, would be either 43 or 47 stitches. Do be sure that your swatch is in pattern as a ribbed pattern will pull in a little bit! I want to make a shawl which would be approximately 30 inches wide. Thanks for writing back! Is your swatch done in the mistake stitch pattern? If so, at 22 stitches over 4 inches, you cast on for a 30 inch wide scarf would be 163 stitches. If your swatch is in garter or stockinette, I would suggest knitting up a swatch in stitch pattern to ensure that your shawl is as wide as you hope! Love your site; everything about it – yarns, patterns. Though I created an account only recently, I have been a frequent visitor. I was hoping to make this beautiful scarf for my friend for Christmas. The pattern says 8″ by 48″. If I wanted to make it 60″, how much more yarn will I need? Thanks for writing in! To get a scarf that is 60″ long you will need 2 additional skeins of 12 Ply Cashmere! You will have a little left over, perhaps enough to make the scarf 64-65 inches long! I love this scarf and I’m planning to knit it soon but will be using two needles. I have been knitting for over 60 years with two needles (one needle under my armpit) and find it slower to knit with a circular needle. Thank you for sharing the pattern. Thanks for your kind words! While we used circular needles here, it is just preference! This lovely scarf can certainly be knit on straight needles! Thank you for reaching out! I recommend checkin out our tutorial on Weaving in your ends– it will give you some tips and tricks on how to make it less noticeable. Love this pattern! I used super chunky yard and US15 needles and I love how it turned out. Thank you for reaching out! What is the gauge of the yarn you are working with? Is it an ombre of greens? I think this Mistake Stitch scarf could be beautiful in an ombre of color. Thank you for this patttern! I am going to make a scarf per your pattern. Thank you so much. Love the idea of this and can’t wait to get started. But, is there any way to get out of blocking, like larger needles, etc.? Or can you give any tips on how you blocked it? I don’t want to stretch it out too much. I tend to avoid patterns that need to be blocked. Thank you for reaching out! I would say that while blocking always helps to create a more finished look it is not a requirement. You can certainly knit this scarf up and not block, but if you would like to block I would check out our Tutorial for some helpful hints! I started making one of these for my pastor. Since he wears mostly black I didn’t want to go too colorful. I chose a black yarn with neon specks throughout.its really looking cool and the color specks give it just enough for a little pizzazz. Hi! So I’m on about my 6th or 7th row (about 1.5-2in), but the ribbing isn’t showing? Is there a specific way the yarn is meant to be moved when going between knitting and purling? I’m just moving it back and forth because it IS pretty straightforward, but I’m not sure if there’s something more I’m missing, or if I just have to finish more rows before the pattern starts to show more. Thank you! Thank you for reaching out! Your stitch pattern should line up on every other stitch. This means that you will have a column of knit Vs, a column of alternating knit Vs and Purl bumps, a column of purl bumps, and then a column of alternating purls and knits. You should be seeing this pattern at this point, but it will become more pronounced as you go. How does the pattern look? Are any of the knits and purls lining up? The first thing I would check is that your stitch count is correct as this will determine how your stitches are lining up from row to row. Has anyone shortened the width on this scarf for a toddler? How many stitches did you co? I’m new to knitting and wanted to make this scarf for my 2 year old but I know 39 stitches would be way too wide for her. Thanks! Thank you for reaching out! I would reccomend a cast on of 23 stitches which will give you a 5″ width. I love your site and patterns. I’ve made a number of scarves like this and they all turn out great. I’ve experimented with different yarns (fuzzy ones are fun!) and needle sizes. It’s hard to really mess this up. Love this pattern. I’m making this scarf right now! I love it. I’m wondering if you think I could make a blanket with the same stitch. Thank you for reaching out! You certainly could, you would just decide on a width and multiply that number by how many stitches per inch you are getting to figure out a good cast on number. You will just want to make sure that it is a multiple of 4 +3. I love the pattern and knit a really cool scarf. Have you ever knit this pattern in the round, ie for a hat? I’m going to try to see if it will work, but if you’ve already figured it out, I’d appreciate hearing from you. thanks. Thank you for reaching out! We don’t currently have a mistake rib hat, but you could use our Classic ribbed hat pattern as a guide. You will just need to change where your purls and knits line up from row to row.